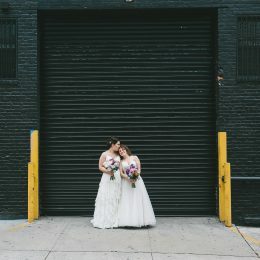 Sasha Smolina is a Wedding and Portrait Photographer based in Manhattan. She specializes in documenting weddings through unobtrusive photojournalism and fashion-forward portraiture. Her portraits draw upon years of experience as an internationally published fashion photographer. Amazing! She ran around all day capturing so many great photos. It was HOT too, and she did it like a champ. Thank You! Before the wedding, she helped us think through our day and provided good insights on what would work and wouldn't work. On our special day, she was a calming influence on us all; she was fun and professional, chill and assertive in all the right ways...and the photos turned out SO GOOD! Highly recommend. ...she was so easy to work with that she felt like another friend. I asked her to direct me and the bridal party when I wasn't feeling up to it, and she was able to do it with kindness and patience. She captured so many special and original moments that seemed to place her everywhere at all times. It is clear she truly has a passion for her work and good creative insight, which is a quality we were really looking for.